The Operations Research (OR) and Operations Management (OM) community has witnessed significant progress in the field of research in blood bank inventory management during the past few decades. The OR and OM community has studied blood inventory management problems at the level of both individual hospital blood banks (HBB) as well as regional blood banks (RBB). The OR and OM literature at the individual HBB level has mainly focused on the determination of optimal policies for collection, ordering, componentizing, cross-matching and issuing of blood and its products. The literature at the RBB level emphasizes on the optimal policies for transshipment, rotation, distribution and scheduling of blood deliveries from the RBB to the HBBs. The objective of this chapter is twofold. In the first place, it provides the readers with a basic understanding of inventory management related problems commonly faced by HBBs. In the second place, it shows how various OR techniques can be used to manage the inventory of blood products in an efficient manner with the help of a real-life case study. This chapter is organized into seven sections. The first section talks of blood and its components. The second section provides a description of the different types of blood groups. Functioning of a typical blood bank is explained in the third section. The fourth section describes various operational decision-making problems at HBBs. The fifth section details out a real-life case study. 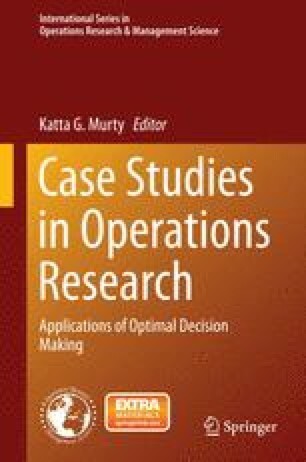 The penultimate section describes recommendations for real-life implementations based on the insights obtained from the real-life case study. The chapter concludes with a set of exercises from the area of blood bank inventory management. The online version of this chapter ( 10.1007/978-1-4939-1007-6_18) contains supplementary material, which is available to authorized users. Wilson, S. (n.d.). Blood in the body: What is blood made of? Red Gold: The Epic Story of Blood. http://www.pbs.org/wnet/redgold/basics/whatisblood.html. Accessed 29 Dec 2012. American Society of Hematology. (n.d.). Blood Basics. http://www.hematology.org/Patients/Blood-Basics/5222.aspx. Accessed on 29 Dec 2012. Wikipedia. (n.d.). Blood. http://www.en.wikipedia.org/wiki/Blood. Accessed 29 Dec 2012. 5 Points of Life. (n.d.). Apheresis donation. http://www.fivepointsoflife.com/teach-learn/what-are-the-five-points/apheresis-donation/. Accessed 29 Dec 2012. Wikipedia. (n.d.). Blood type. http://www.en.wikipedia.org/wiki/Blood_type. Accessed 29 Dec 2012. O’Neil, D. (n.d.). ABO blood types. http://www.anthro.palomar.edu/blood/ABO_system.htm. Accessed 29 Dec 2012. Wikipedia. (n.d.). Cross-matching. http://www.en.wikipedia.org/wiki/Cross-matching. Accessed on 21 May 2013. Society for the Advancement of Blood Management. (2012). Glossary, Iron Corner. http://www.iron.sabm.org/glossary/index.php. Accessed 26 Sept 2012. Wikipedia. (n.d.). Blood bank.http://www.en.wikipedia.org/wiki/Blood_bank. Accessed 29 Dec 2012. Wikipedia. (n.d.). Blood donation. http://www.en.wikipedia.org/wiki/Blood_donation. Accessed 21 May 2013. World Health Organization. (2010). Towards 100 % voluntary blood donation. A global framework for action. http://www.who.int/bloodsafety/publications/9789241599696eng.pdf. Accessed 21 May 2013. Blood Index. (n.d.). Voluntary, altruistic blood donation has proven to be safer than paid or replacement donation. http://www.bloodindex.org/viewarticle.php?id=9. Accessed 21 May 2013. Red Cross. (n.d.). Blood Components. http://www.redcrossblood.org/learn-about-blood/blood-components. Accessed 21 May 2013. Central Drugs Standard Control Organization. (2012). Regulatory requirements of blood and/or its components including blood products. http://www.cdsco.nic.in/html/guideline.htm. Accessed 26 Sept 2012. Lane Blood Center. (n.d.). Blood facts.http://www.laneblood.org/blood-facts/. Accessed 21 May 2013. Animal Health Diagnostic Center. (n.d.). Blood components. http://www.ahdc.vet.cornell.edu/clinpath/modules/coags/comp.htm. Accessed 22 May 2013. AABB. (2013). Whole blood and blood components. http://www.aabb.org/resources/bct/bloodfacts/pages/fabloodwhole.aspx. Accessed 26 Sept 2012. The Blood Bank. (n.d.). Facts about blood.http://www.thebloodbank.org/factsaboutblood.asp. Accessed 22 May 2013.